Hearts head coach Robbie Neilson has set his sights firmly on surpassing Aberdeen in the Scottish Premiership after his side thumped Motherwell 6-0. Three goals in the opening 21 minutes set them on their way before Callum Paterson, Juanma and Arnaud Djoum added further misery to Mark McGhee's side. 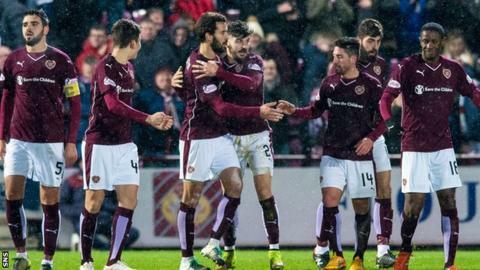 The result moved Hearts to within three points of second-top Aberdeen, who they beat 1-0 in the Scottish Cup last week. "Last week was the benchmark and we've carried it on into this week," he said. Neilson was quick to ensure his side keep their feet firmly on the ground but is happy to see his side put pressure on the Dons. "We're not going to get carried away," Neilson told BBC Scotland. "We had a good result last week, we've had a fantastic result this week, but we've still got a long way to go. "The players have still got to improve vastly if they want to get to where we want to be, which is challenging Celtic, and we've still got Aberdeen in our sights. "It's been good so far, but there's still a long way to go and a lot of improvement in this team. "Aberdeen are a good team. They're the team that everybody said at the start of the season should finish second. "If we can beat them to it then it would be a huge achievement for us, but they're still the benchmark for us to try and get to." Motherwell manager Mark McGhee described his side's heavy defeat as a "hiccup" but felt their recent good form had perhaps taken something out of them. "It's not an afternoon to forget," said McGhee, whose side had previously been unbeaten in six games. "It's an afternoon to reflect on and work out why something like that happens. "This afternoon, we weren't the team we've been in recent weeks. "We didn't have the energy, we didn't have the aggression or the determination that we've had. "When you come to Tynecastle against a really good Hearts team who have that energy and really good variety in their play, you've got to be really at your best here at the moment and we weren't. We were well beaten. "None of us were really at it. There was a general malaise about us that's not been there. "Maybe the last six games has taken it out of them and they needed this hiccup to kick them on again. I hope so."